Since 2004 we've been honing and polishing our online marketing skills. We're rather different to the typical online marketing agency. We started as a specialist online lead generation business providing clients with sales leads on a pay per performance basis. Working on this basis made us rapidly learn about how best to extract value from PPC Paid Search marketing, Email marketing and Affiliate Marketing! It also made us develop websites that work very effectively to capture sales enquiries. And it forced us to measure every aspect of our lead generation business - so we think we're rather good at web analytics too. If we hadn't learned quickly and become good at using all these online marketing tools then we wouldn't be here today! We now offer all our online skills to other companies so that you too can benefit directly from what we have spent years learning about. Affiniti's founding director, says "Even though the online market continues to grow rapidly there is no doubt that it's as ruthless as any other business sector. When you're running an online business you need to work with an agency that really does have the skills to help you achieve your business objectives." We combine website design and build skills with the full complement of online marketing services. Obviously you can start by using one of our services knowing that we're capable of helping you with other aspects of your online presence whenever you need it. We're based in Reigate, Surrey which means very easy rail and road links. The beauty of the online world is that being a small or medium sized firm is no longer a disadvantage. The key is to put together a coherent and effective online marketing presence. 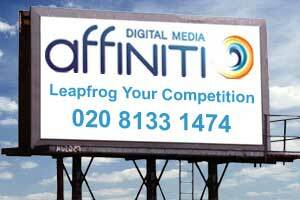 Affiniti has the tools and experience to make this happen for you.